The Honda stand at the Thai Motor Expo is currently displaying the manufacturer’s latest products, including the new 2019 CBR650R and CB650R. 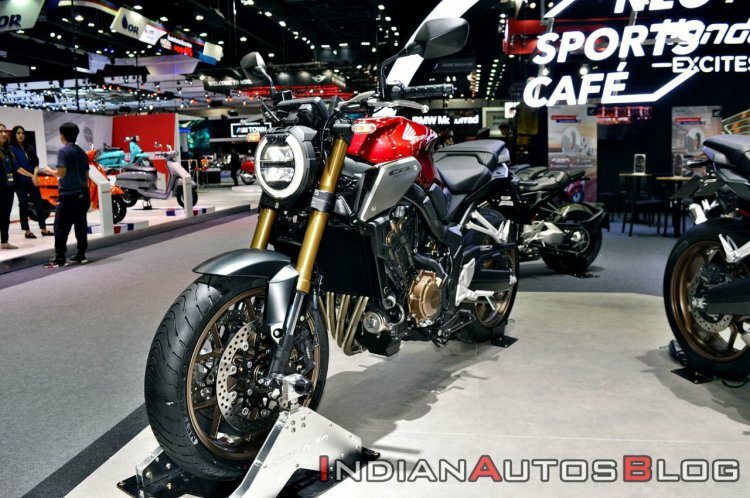 In this post, we will talk about the CB650R middleweight roadster that made its debut at the 2018 EICMA motorcycle show. 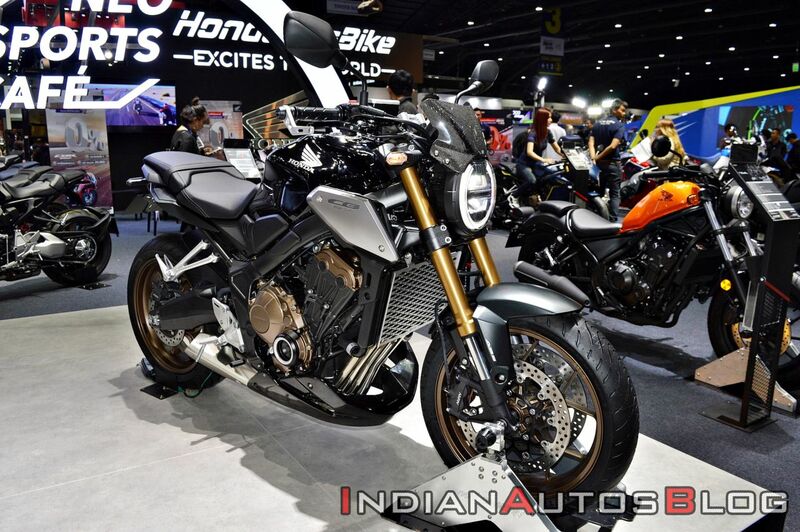 The standard model was accompanied by a limited edition model, the 'CB650R Muscular Edition' at the expo. The limited CB650R Muscular Edition accessorised version of the Honda CB650R (pictured) at the Thai Motor Expo included under-cowl, wheel stripes, front visor and tank pad among others. For 2019, the middleweight roadster features the Neo Sports Cafe styling that was first seen on the CB1000R and is also available on the CB300R and CB150R. Thus, the new fascia features round, full-LED headlight that gives the bike a retro look while full LED lighting adds a modern persona to the package. The retro-style fuel tank features shrouds that give the CB650R a muscular look. The split-seat design, identical to the CBR650R, also looks modern and visually appealing. Sportier ergonomics complements the updated styling. Compared to its predecessor, the CB650F, the handlebar on the CB650R is 13 mm forward and 8 mm lower. The repositioned handlebar, along with more rear set footpegs – 3 mm back and 6 mm higher – give the motorcycle aggressive riding ergonomics. Under the retro styling is the same motor that also propels the CBR650R. Thus, the CB650R uses the same the 649 cc inline-4 cylinder, liquid-cooled, 4-stroke, 16-valve, DOHC engine that delivers 95 hp of maximum power at 12,000 rpm and 64 Nm of peak torque at 8,500 rpm. The motorcycle also benefits from assist/slipper clutch. Stopping power comes from four-piston radial-mount brake callipers that grab the 310 mm wave-pattern floating discs at the front. At the rear, is a single-piston rear calliper and 240 mm disc. Safety net includes Two-channel ABS and Honda Selectable Torque Control (HSTC). Shock absorption duties are performed by 41 mm Showa Separate Function Fork (SFF) USD front suspension (instead of conventional units on the CB650F) and a 7-stage spring preload adjustable monoshock at the rear. The standard Honda CB650R is priced at 305,000 baht (INR 6.47 lakh*) while the CB650R Muscular Edition will be available at 324,500 baht (INR 6.89 lakh*). The new Honda CB650R benefits from the Neo Sports Cafe styling that is also seen on the new CB1000R, CB300R and CB125R. In an interview this month, Minoru Kato, President, Honda Motorcycle and Scooter India (HMSI) said that the company has a strong intention to introduce new products in the premium segment post the BS VI emission norms implementation (April 2020), right from 160, 200 and 300cc segments. However, he did not make any comments on the 650cc segment.